The Mexican-American War of 1846-1848. "Mexico has passed the boundary of the United States, has invaded our territory and shed American blood upon the American Soil. She has proclaimed that hostilities have commenced, and that the two nations are at war." The U.S.-Mexican War began on April 25, 1846 . It ended nearly two years later, on February 2, 1848 . Of great importance in American history I find that when I tell people of my interest in the badges of this conflict many are completely unfamiliar with it and often confuse the Mexican-American War with the earlier Texas Revolution (Remember the Alamo !) or the later Mexican Border skirmishes. This seems due primarily to the onset of the American Civil War which greatly eclipsed even this momentous conflict. Historians are divided as to where to lay blame for the war; was it American Imperialism at its worst or our Manifest Destiny to move into territory barely served by the Mexican Government? What the war unquestionably did was to bring into being a substantial portion of what is now the United States of America and was as much a foreshadowing of the American Civil War as the Spanish Civil War of 1936 was to WWII. Many of the officer's of this conflict would later meet in the Civil War: Lee, Jackson, Grant, Bragg, Meade, McClellan, Sherman, Pickett, Beauregard, Longstreet, Armistead, Johnson, Hancock...the list goes on! The Treaty of Guadeloupe Hidalgo ended the war fixing the Rio Grande as the boundary of Texas and as an indemnity for losing a war that the Americans claimed they did not want required Mexico to cede to the U.S., in return for $15 million, the territory which includes the modern states of California, Arizona, New Mexico, Nevada, Utah, as well as parts of Colorado and Wyoming. ; a loss to Mexico of nearly 1/2 her territory. The roots of the war lie in the Texian rebellion of 1835 when Americans in Texas rebelled against the government of Mexico . On March 2, 1836 they declared Texas an independent republic. When Mexican President Antonio Lopez de Santa Anna led an army into Texas to put down the rebellion, (after the famous battle of the Alamo ) he was defeated and captured by General Sam Houston at the Battle of San Jacinto, April 21, 1836 . Santa Anna signed a treaty recognizing Texan independence. The Mexican Congress repudiated the treaty, but the republic of Texas maintained its independence for ten years. Recognized by the United States , France , Great Britain , and Belgium ... Mexico still would not accept the loss of Texas . The result being that when President James K. Polk offered terms of annexation to Texas in 1845, Mexico threatened war. Texas accepted the U.S. offer and on December 29, 1845 was formally admitted to the Union . Beginning in August of 1846 in response to Mexico 's threat of war, Brigadier General Zachary Taylor moved troops into Corpus Christi and the "Nueces Strip" between the Rio Nueces and the Rio Grande . Mexico responded with a similar warlike posture. Taylor informed the Mexicans that in his opinion he had not taken any hostile action, but the Mexican government claimed that the mere presence of American troops was a hostile act. Taylor in turn replied that if a war began, the responsibility for it would lie with whomever fired the first shot. As a result of a growing Mexican military presence, Taylor asked the U.S. Navy to blockade the mouth of the Rio Grande . Another action he apparently intended as defensive in nature only. Acting on an earlier threat, General Mariano Arista ordered his Mexican troops to cross the Rio Grande . On April 25, 1846 at Rancho de Carricitos (near Brownsville , TX .) Mexican forces attacked U.S. Dragoons under Captain Seth Thornton with losses of 14 Dragoons killed and the rest taken prisoner. The Mexican American War had begun. Before it's finale well over 5,000 Americans would become casualties of combat and disease. Warfare slackened in mid 1846 while Volunteers, under Congressional Authorization for twelve months of service arrived en masse. American forces began to advance through Texas and New Mexico . The Battle of Buena Vista (Angostura, as it is called in Mexico ) against the forces of Santa Anna, was the costliest battle of the war. In a rough and bloody battle, the Mexican's for a time held the upper hand. However, in the end, General Taylor added another victory to his name. (Of course helping greatly in his candidacy for the Presidency in 1848.). By the end of 1846, President Polk had concluded that if the war with Mexico was to be won U.S. troops must take Mexico City . Therefore in March of 1847 General Winfield Scott's army landed at Vera Cruz with the intent on accomplishing just that. Reinforced by Volunteer and Regular Army Regiments as well as troops of Taylor 's forces, Scott formed the "Army of Invasion". On March 9, 1847 the invasion began when American troops landed on the shore at Collado Beach , south of Vera Cruz. The amphibious landing of some 10,000 troops at Vera Cruz represented one of the largest military undertakings to date and the greatest seaborne assault until World War Two. Siege and battle took Vera Cruz on March 29 and Scott began marching inland towards Mexico City . One of the heaviest engagements of this campaign occurred on April 18, 1847 on the road to Jalapa . Santa Anna's troops fought hard from strong defensive positions but in the end they retreated in such disarray that among the items left behind was Santa Anna's extra wooden leg! Though the American offensive slowed as many of the one year Volunteer regiments ended their enlistments and returned to New Orleans , mid 1847 saw American troops massing against the Capital of Mexico City. In August General Scott advanced against the well fortified city. Warfare and politicking occupied the weeks until September 13th when Americans stormed the fortress of Chapultepec , the bastion of Mexico City . At last Scott's Army of Invasion marched into the Main Plaza where the American Marines raised the flag over the Palace "Halls of Montezuma". Santa Anna was deposed (again) a month after Mexico City fell and eventually returned to his exile. An uneasy and often bloody lull followed, with the treaty signed on February 2, 1848 and President Polk presenting it to the American people on July 4th. The Volunteer and Regular Army troops returned from Mexico to a tumultuous hero’s welcome. Speeches, parades, and newspaper praise awaited them. Officers and other notables were presented with swords, goblets of honor, land and other tributes. Soon talk began of giving medals to all who served. The badges of honor given to American soldiers who served in the Mexican-American War can rightfully be considered the first American Campaign medals and if one omits the somewhat unique Revolutionary War Badge of Military Merit, the first American military medal. Three specific medals were struck. One by the State of South Carolina, another by the City of Charleston, and a third by the City of New York. The South Carolina State Medal, or Palmetto Medal, is a well struck table medal given in silver to enlisted men and NCO’s and in gold to officer’s. In the event of death it was presented to the next of kin. Named on the reverse, the NCO and officer medals give the rank whereas awards to Privates simple state the name. 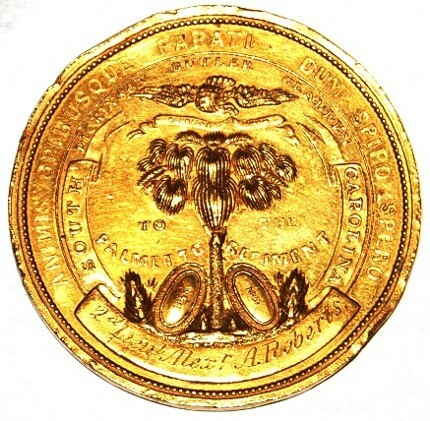 Authorized by the SC General Assembly in 1848 the Palmetto Medal was engraved by William J. Keenan and struck by the Charleston firm of Hayde, Brother and Company. 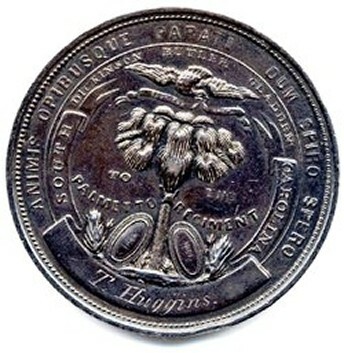 Minted in the 1850’s, early examples have the name Keene found on the strike. It is accurately estimated (thanks to research by Jack A. Myers of Columbia , SC.) that 882 medals were struck and presented. 68 gold and 657 silver (with 157 of these to NCO’s). Myers has so far tallied fewer than 70 known remaining medals! Bronze unnamed strikes are known to exist. 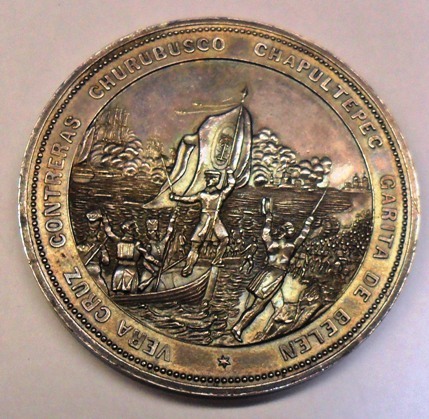 The Charleston Medal for the Mexican War was given in silver to both officer’s and enlisted men of the Charleston Company of the Palmetto Regiment. Another well made medal these were also named to the recipient. One side of the medal has a presentation from the city and on the other is a depiction of a soldier with the Palmetto flag and a list of the various battles of the campaign. There were 103 eligible men in the company and it is assumed that an equal number were struck and presented making this the scarcest of the three medals. The New York City Medal for the Mexican War is the third in this trio of well made table medals. It is a two inch, two ounce silver medal, slightly smaller than either of the SC medals. Presented named, this medal for the officers and men of the New York City Volunteer Regiment was designed by C.C. Wright and is very much a companion piece to the South Carolina Medals. 1,100 men were eligible for this award based on the rolls of the unit. Douglas Boyce, who has researched and written extensively on the medals and badges of the Mexican War estimates that between 400 and 600 were struck and awarded. What toll time and assorted frenzies to melt down silver has taken on this medal is unknown. Unnamed bronze casts of this medal are known as well. * Shown above is the monument erected in Camden , SC to Lt. Col. James Polk Dickerson. Born in Camden in 1816 and a veteran of the Seminole War under Captain John Chesnut, Dickerson was elected Lt. Colonel of the regiment formed in Camden in the call to arms for the Mexican War. Severely wounded in the first battle of Vera Cruz Dickerson lead his companies against a large body of Mexican Lancers. At Churubusco he seized the units colors from a fallen color bearer and was once again wounded. Refusing amputation of his wounded foot he died on September 12th 1847 at age 31. One can only conjecture what fame would have met him had he survived. His remains were returned to Camden where in 1856 his body was interred to Monument Square under this impressive Italian marble. 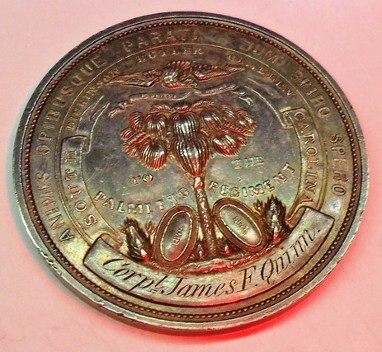 Obverse of the South Carolina Palmetto medal in silver as given to enlisted men and NCO's of the Palmetto Regiment. 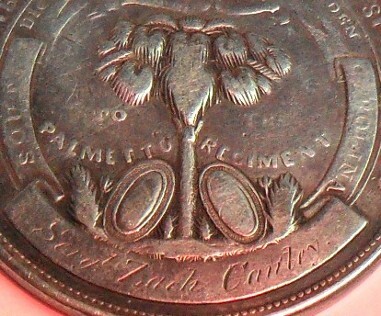 Reverse of the South Carolina Palmetto medal in silver. 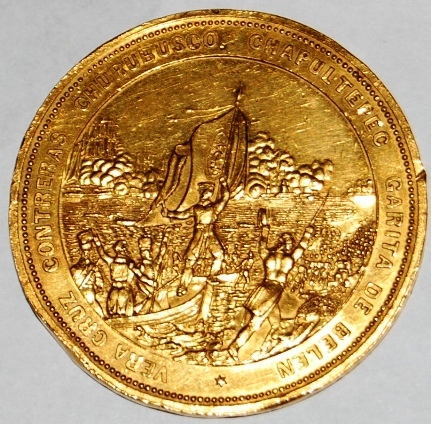 Rare South Carolina Palmetto Medal in gold for officers. Other Mexican War Veterans material. Camden Heritage. Rachel Montgomery. R.L. Bryan, Columbia , SC 1971. Roster of the Palmetto Regiment. By Jack A. Meyer. South Carolina In The Mexican War. By Jack A. Meyer. State Medals For War Service By Douglas W. Boyce.